At least it looks that way, according to a recent survey. The younger generation, targeted as 18-34 year olds, showed more interest in technology than their older counterparts, which is no surprise given the fact that they’ve almost exclusively grown up in a technological world. This is where non-financial institutions, such as Google and Wal-Mart, can sway the younger crowd from traditional banking institutions. They are less concerned about convenient locations and plentiful ATM locations than they are with having access to real-time information and mobile opportunities to do their banking. Wal-Mart started the trend by offering the lowest prices on money orders and check cashing. They more recently teamed up with American Express to offer Bluebird, which is a pre-paid card that can be used like any debit or credit card and makes financial tasks simpler and with no ties to a financial institution. Furthermore, according to a Washington Post article, there are no credit checks and the cards can be used at ATM’s. This is appealing to some, and analysts predict that it could be a game changer in banking competition. 1. Strike a balance: with two age groups with two separate sets of needs, it can be difficult for banks to remain competitive while offering “something for everyone.” One striking result that banks can work toward is the high response rate for those feeling that banking is transactional, not relationship focused. Similarly, a good number of respondents claim to want banks to proactively suggest products or services, and be more of a help with bigger financial needs. The relationship aspect can go a long way with both age groups, and banks can use this as a guiding post for making sure that transactions, no matter how simple, build on the customer relationship. I noticed at my bank recently that the drive-thru experience was a little different and I believe aimed at that relationship aspect. When I pulled up to the speaker, I was greeted by the teller’s face on a screen right outside my window. While it startled me, I thought it was a nice touch to add to the personalized effect of the transaction – it wasn’t just a voice behind a tinted window. 2. Look forward: the younger group is the next up and coming generation of consumers. Incorporating technology and advances to the way consumers use banks is a must, if it’s not in place already. This generation has grown up with a sense of immediacy and convenience. 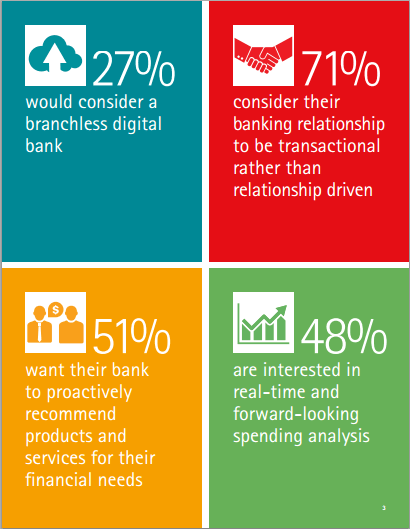 To stay competitive, banks need to gauge their efforts and marketing strategies to capture this younger generation. Take a look at your bank’s demographics with regard to age – this can help determine your next steps in offering services, mobile technology, and the like. Target your younger customers and survey them to see what their satisfaction levels are now, how aware they are of the full suite of available services, and what they’d like to see as a customer. Taking this step can help determine next steps. Technology has made competition more fierce in almost every industry, and it looks like banking is no exception. Staying competitive in a “bankless” industry can be a challenge, but one that can be met with success.